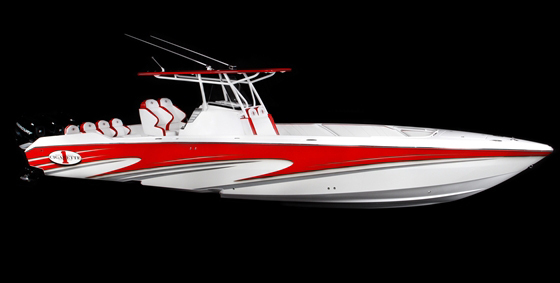 The new fifty foot model from Cigarette is one every performance-boat lover would want. For the first time in many years—I’m not sure how many, but let’s say ten —I missed the Miami International Boat Show in February. Deadlines and personal commitments, plus an assignment to cover the Miami Boat Show Poker Run the following weekend, kept me home in California. 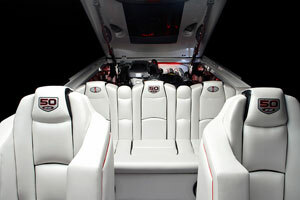 The new 50’ Marauder features a completely redesigned and extended deck for a “classic” Cigarette look. I was just slightly disappointed. I mean, it wasn’t as if I didn’t know what was going to be unveiled. Thanks to Mercury Racing’s Fred Kiekhaefer and a scary-legal non-disclosure agreement he had me sign a year ago, I knew that Mercury Racing was going to unveil an 1,100-hp version of the 1,350-hp quad-overhead cam engine it released at the show last year. I knew what was going to be in the display booths of Cigarette Racing Team, Marine Technology, Nor-Tech, Outerlimits, and so on. So I didn’t miss out any “breaking news,” per se. But I did miss the Cigarette display itself, which is, frankly, my perennial favorite display at the show—and not just for the herds of beauties the Opa-Locka, Fla., company hires every year to staff the booth. OK, I confess, they’re a plus, as is the lavish Thursday night VIP gig. Without question, Cigarette Racing Team owner Skip Braver knows how to throw a party. 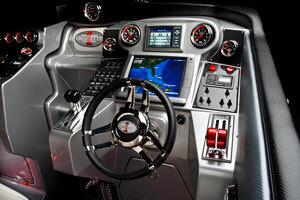 The helm station in the 50’ Marauder’s cockpit lacks for nothing. But what I missed about the Cigarette display this year, even though I knew what was going to be in it, was the scale and grandeur of the company’s truly iconic V-bottoms. And if the 46’ AMG Rider stole the show last year, the darling of the Cigarette booth this year was the 50’ Marauder. I know because, while I didn’t get to see it in the Miami Convention Center, I did get to watch it run in the Florida Keys for the poker run the following weekend. And the redesigned 50’ Marauder is—no exaggeration—the most beautiful Cigarette I’ve ever seen. Earlier versions of the boat, most of which were sold to European buyers, had giant cockpits and relatively short decks. That look was just fine overseas, but according to Braver and longtime Cigarette dealer extraordinaire Phil Lipschutz, that layout didn’t provide the “classic” Cigarette appearance. So Braver, Lipschutz and Cigarette’s Bud Lorow came up with a longer deck, a slightly smaller cockpit—the same size cockpit found in the 46’ Rider—and added a foot to the engine room. Plush bucket seat and a three-person rear bench provide seating in cockpit. 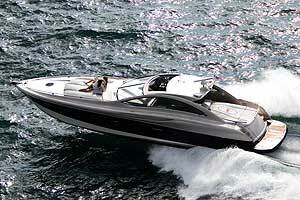 In previous incarnations, the 50’ Marauder had been a triple-engine boat. 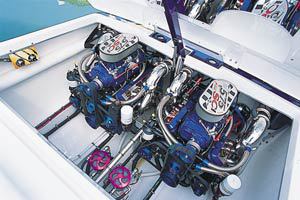 In one application, the builder set up it up with three Mercury Racing 1075SCi engines, with two of the power plants forward and one aft. Cigarette built another 50’ Marauder with triple Mercury Racing 700SCi engines, but that time they located two of the engines aft and only one forward. 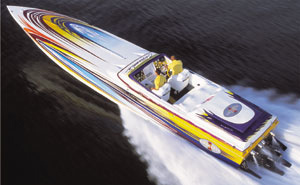 But when Mercury Racing unveiled its 1350—both in the Cigarette 46’ AMG Rider and in its own booth—last year, Braver, Lipschutz and Lorow were sure it would find a great home in a twin-engine 50’ Marauder. Turned out they were right. 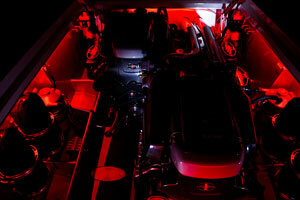 Twin 1,350-hp turbocharged engines from Mercury Racing provide power for the 50’ Marauder. According to Braver and Lipschutz, Cigarette also made modifications to the 50’ Marauder’s bottom to better accommodate the twin-engine application. However, beyond saying that the hull was “blueprinted,” both men declined to offer additional detail. 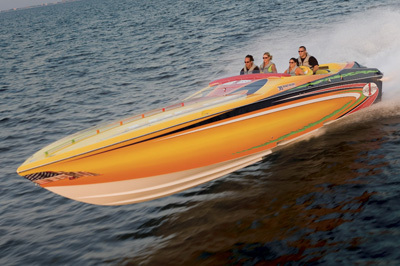 Top speed for the boat “propped for acceleration” to date has reportedly been 120 mph. Braver said he expects the boat to top out at 125 mph. 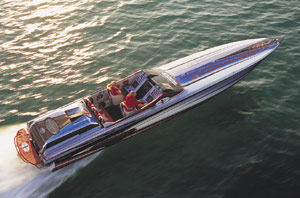 According to Braver and Lipschutz, the boat has already been sold to a 67-year-old buyer in the United States. That will bring the total of 50’ Marauder models in the U.S. to three—the rest are in Europe. At present, said Braver, two more 50’ Marauders are in production. Completion time is four to five months down the road. 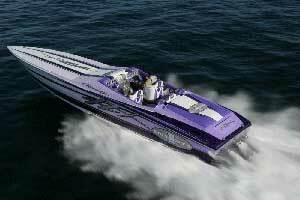 Price with the Mercury Racing engines and drives, as well as a bevy of options, is slightly less than $1 million. Not exactly the custom go-fast V-bottom every performance-boat lover can afford, but definitely one every performance-boat lover would want. For more information, visit Cigarette Racing Team. 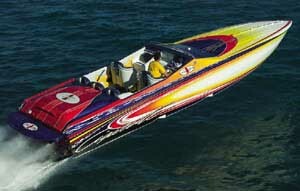 Matt Trulio is the editor at large for Powerboat magazine. He has written for the magazine since 1994. Trulio’s daily blog can be found on speedonthewater.com, a site he created and maintains, which is the high-performance arm of the BoaterMouth group.